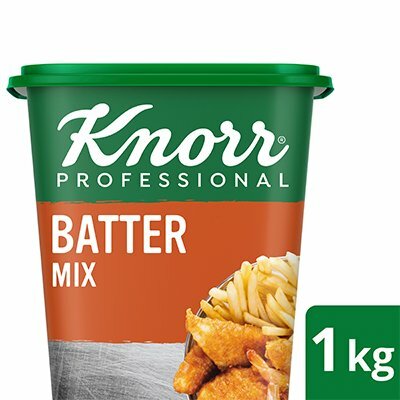 Knorr Batter Mix is used to prepare spicy marination or coating batter for fried chicken, fish or vegetables. Use Knorr Batter Mix for spicy coating on fish, chicken and vegetables. • For 1 Kg meat: Marinate 1 Kg meat in 75 gms of Knorr Batter Mix and 100 ml water and leave for 30 minutes. • Heat oil up to 150°C and fry marinated chicken till golden brown. • Or Make batter by mixing 75 gms of Batter Mix in 100 ml of water, coat meat in Batter mix and fry till golden brown. Add some oil in the batter to prevent from sticking during frying.